Yes, not all stockings are created equal. Compression helps patients with circulation problems due to a wide variety of maladies and, at first glance, compression stockings and anti-embolism stockings may seem like the same thing, but there are subtle differences that are quite important. Knowing the subtle differences in each can help you choose the proper type of compression stocking and head off any potential health issues down the road. Confusion can surround the selection of compression stockings. On the surface, the concepts of medical compression stockings and those that are specifically designed for anti-embolism purposes seem akin to each other. Unfortunately, there are differences that make them not as interchangeable to the naked eye. 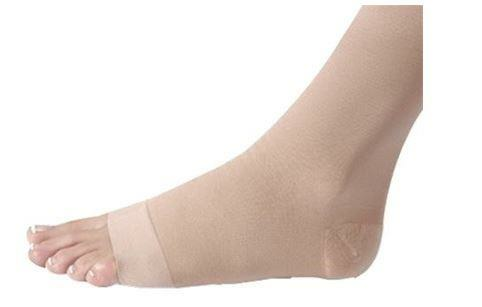 Anti-embolism stockings (also known as TEDs) are primarily designed for the prevention of venous thromboembolisms. These types of stockings are usually prescribed for patients that are immobilized due to surgery or for some other reason. TED is an acronym for thromboembolic disease. 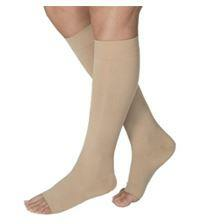 These stockings employ graduated compression with more compression near the ankle gradually lessening up the leg. Since these are worn by non-ambulatory patients the saying goes, “TEDs are for beds.” To differentiate the stockings from others, they are almost always manufactured in white and can have an open spot near the toes for easy inspection. Medical compression stockings differ in that they are designed for patients that can actually get around and are not bedbound. Your physician can determine what type of compression stocking is right for you as well as the appropriate compression level for comfort. In contrast to TEDs, common compression stockings can be part of the patient’s long-term preventative care and treatment for a wide variety of reasons. These are available in a variety of colors and styles unlike the TEDs which are primarily white. Each person’s need for a compression stocking may be different. You should work with your physician to determine your specific needs. Compression stockings are rated by how much pressure they provide to the veins in your legs to improve circulation. Many stockings, both TEDs and medical compression stockings, use graduated pressure that provides more compression at the ankle and gradually decreases up the leg. Depending on your need, knee-high stockings may be all you need whereas in some instances you may require thigh-high compression stockings. These stockings are measured by their rate of compression or pressure created by the stocking. These are measured in an atmospheric pressure amount represented by a value in mmHg (millimeters of mercury). Some stockings are rated at 15-20mmHg for those that may need light/moderate compression or for more compression 30-40mmHg. Since the stockings compress and put pressure on our lower extremities, it’s important to make sure that they are not too tight. To avoid this, open toe versions are available to allow for easy inspection of our toes to make sure circulation remains normal. No matter the need for compression, there is an option for compression stockings for you. With a variety of compression ratings and types, you can incorporate them into your everyday lifestyle. Men and women both can choose what works for them and their fashion sense! !